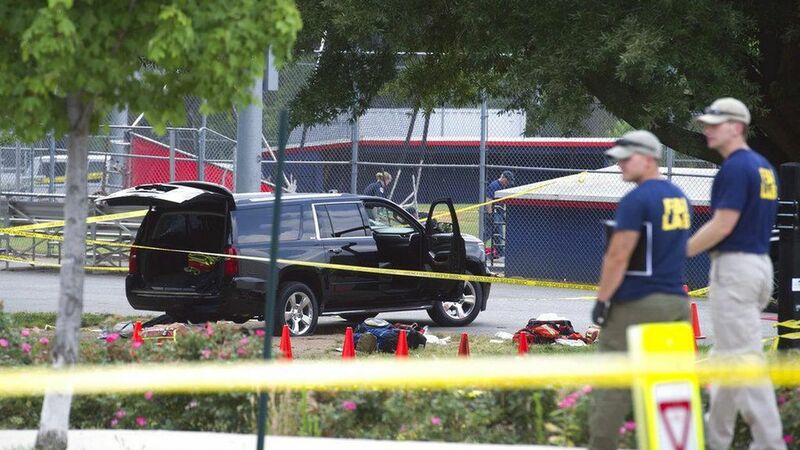 During yesterday's marathon coverage of the shooting of House Majority Whip Steve Scalise, ABC's George Stephanopoulos mused whether the chilling attack on a practice for a charity baseball game might act as a "circuit-breaker" on the nation's overheated politics. For one day, it did. Congressional leaders of both parties expressed shock and solidarity. President Trump rose to the occasion: "We may have our differences, but we do well, in times like these, to remember that everyone who serves in our nation's capital is here because, above all, they love our country." Could the shooting do for Washington what 9/11 did for the country — usher in a prolonged season of unity? Hard to see. As Mark Z. Barabak writes in an analysis for the L.A. Times: "The attack almost seemed a natural, if sick, extension of the virulence that surrounds the country's increasingly tribal politics." Per Axios' Jonathan Swan: "Most everyone in this town is just rattled. ... The dark secret on the Hill is that members and their staffs often think about how easy it would be for a madman to take them out." "On the right, I've heard a lot of frustration about the media. The refrain I hear is that when it's a conservative who shoots, then their political hero has to answer for it." An email from a Republican lobbyist reflects that mindset: "Until both sides admit they've made things worse, this will never get better. Both sides need to admit they can do better before anything will get better." "Many GOP believe that Republicans are held to different standard when it comes to gun control. The conversation would be so different if the Dem practice was hit by a Ted Cruz supporter." The bottom line: Representative Scalise remained in critical condition last night, and doctors said he will require additional operations. Washington, too, has a long road to healing. Catch up quick, with Axios' one-screen update on the shooting. N.Y. Times Quote of the Day ... Rep. Mike Bishop (R-Mich.), who was standing at home plate when a gunman said to be upset over Trump's election began shooting Republican lawmakers: "He was hunting us at that point." Connecting the dots ... President Trump learned a lot this week about Congress' power to influence his foreign policy, Axios' Jonathan Swan writes. Congress (reluctantly) allowed for his aggressive pivot towards Saudi Arabia but on Wednesday the Senate made his life even more difficult in relation to Russia. Republican Sen. Rand Paul led a bipartisan effort this week to block Trump's planned sale of more than $500 million of precision weapons to Saudi Arabia. Why this matters: Had Paul and Co. succeeded, they would've stymied a major part of Trump's Middle East strategy. In the end, Trump won. The vote on Tuesday was close — 53-47. 2. Russia: The Senate voted 97-2 yesterday to strengthen sanctions against Russia.Between the lines, per Foreign Policy magazine: "Administration officials, led by Secretary of State Rex Tillerson, sought to convince lawmakers not to codify the Russia sanctions, since that could remove some of the administration's diplomatic maneuvering room. "Why this matters: Congress is effectively preventing Trump from lifting sanctions on Russia — which means he's got far fewer carrots available to deal with Vladimir Putin. In less than five months since Trump took office, Congress has systematically crushed his plans to improve relations with Russia and explore a serious partnership to fight ISIS in Syria.Another eye-opening read by Swan ... "Republicans sense pattern: Trump vents, then damaging leaks emerge." The world's largest tech companies — Google, Facebook, Amazon, Microsoft and Apple — have become enormous concentrations of wealth and data, drawing the attention of economists and academics who warn they're growing too powerful, Axios' Kim Hart writes. Our thought bubble: Despite populist promises, cracking down on Silicon Valley is not one of President Trump's near-term priorities. Makan Delhrahim, Trump's top antitrust enforcer at the Justice Department, has pledged to to enforce antitrust violations with respect to online platforms just as he would with any other industry, but insiders expect him to be cautious. And Maureen Ohlhausen, acting FTC chair, said in a recent speech that the agency has no intention of meddling in the way tech companies use algorithms and data. Kim Hart outlines the cases for and against more scrutiny. 6. "When I think about the big things, I think about AR"
"You've talked a lot about augmented reality at the heart of the company's future. How do you see AR moving forward?" Cook: "I think it is profound. I am so excited about it, I just want to yell out and scream. ... We've talked to IKEA, and they have 3D images of their furniture line. You're talking about changing the whole experience of how you shop for, in this case, furniture and other objects that you can place around the home. You can take that idea and begin to think this is something that stretches from enterprise to consumer. There's not a lot of things that do that." "What's been your experience of working with Donald Trump?" "At the end of the day, I'm not a person who's going to walk away and say, 'If you don't do what I want, I leave.' I'm not on a council, so I don't have those kind of decisions. But I care deeply about America. I want America to do well. America's more important than bloody politics from my point of view." Relaunch of Bloomberg Businessweek ... Letter from Editor Megan Murphy: "The new Bloomberg Businessweek is more global, with American, European, and Asian editions. ... A redesigned app [features] a curated selection of daily content, customized for readers by region." "The show's format of deep-dive analysis and investigative reporting is not easy to produce, and a typical day can last anywhere from 12 to 14 hours. Maddow, who lives with her longtime partner, photographer Susan Mikula, in western Massachusetts, maintains an apartment in Manhattan where she lives during the week, making the three-hour-plus drive back and forth to Massachusetts every weekend. Boston Globe front page, "Harvard's president to step down next year," by Laura Krantz: "Harvard University president Drew Gilpin Faust, who shepherded the school through the turbulence of the economic recession and expanded its diversity, will step down in June 2018 after 11 years leading the 380-year-old institution." "Faust announced her pending departure in an e-mail to students, faculty, and staff Wednesday afternoon, igniting an instant buzz on campus and among alumni and the wider world of higher education." Globe sidebars: "Harvard had just 28 presidents in close to 400 years" ... "There were 11 Harvard presidents before US was a country." "Moonachie, New Jersey-based Swintec appears to be one of the last typewriter makers, selling translucent electronic machines largely to jails and prisons. ... [O]perators of thrift stores and estate sales say typewriters are some of the quickest items to go."